When we worked in Turkmenistan’s capital, Ashgabat, for a couple of months at a time in the 1990’s after the fall of the Soviet Union, we were amazed by how closed the people were, evidently afraid of saying something which could be interpreted as critical of the regime. 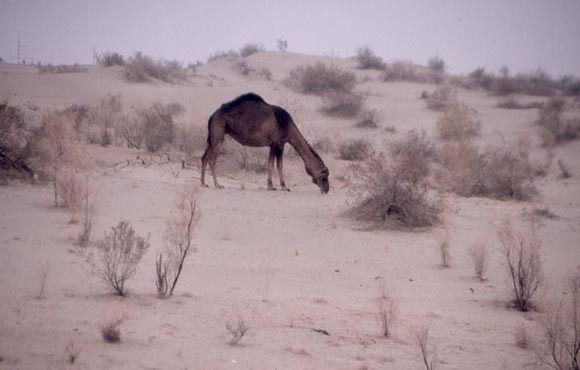 Turkmenistan is mostly harsh desert and is really hot in the summertime. The people raised great horses, bred “karakul” sheep, hired themselves out as mercenaries, and were very annoying slave traders and caravan robbers. Turkmenistan has the smallest population of the former Soviet Central Asian republics and seems even more isolated because of its strange government. The Turkmen cultural identity was formed by many centuries of living in close proximity on the steppe. After the break-up of the former Soviet Union, Turkmenistan was effectively a dictatorship led by President-for-life Saparmurat Niyazov. Niyazov named himself Turmenbashi (father of the Turkmen) and wrote a spiritual guide for his people, “Ruhnama”, which was required study in all schools. Following thus cult of personality, the sides of many buildings were painted with huge portraits of Niyazov, extending to the roofs. At one point, when he had his hair dyed, a cadre of painters worked through the night changing grey hair to black. Niyazov had cities named after him, and even re-named the months of the year. I remember flying Turkmen Airways, when they offered for sale a perfume named after Niyazov. Niyazov died in 2006, and his successor has not yet made drastic changes. Foreign investors have stayed away, and the economy is poor. Turkmenistan’s great hope is the exploitation of its large oil and gas reserves. To us, the Turkmen are noteworthy because they were the greatest carpet weavers in Central Asia. Their products were often called “Bukhara” rugs, not because they were woven in Bukhara, but because they were traded in that city on the route of the “Silk Road”. 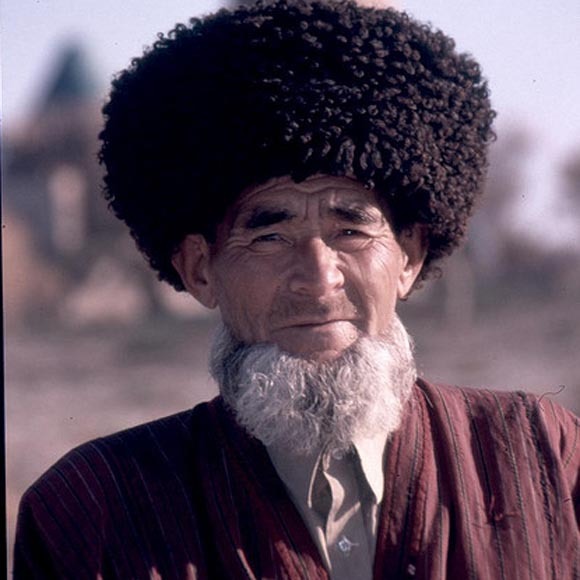 The six main Turkmen tribes–Tekke, Yomut, Ersari, Chodor, Salor and Saryk–as well as sub-groups, each had their own distinctive patterns and ways of knotting. Some of the carpets from the 18th or 19th centuries are so beautiful that they are sold for as much as US $ 100,000.00 and are the subject of countless exhibitions in the U.S. and Europe. 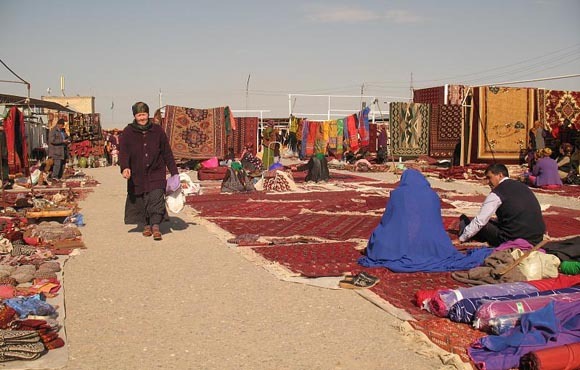 There is a particularly passionate group of rug collectors who focus on Turkmen weavings and share opinions in sites such as www.Turkotek.com.